Firstgear has given the Expedition suit a proper going over for winter 2013. Some of the features that they have carried over are the fit(Large and Long, great for taller riders that have had trouble trying to wear a one piece suit in the past), color(Black/Grey only), under helmet rain hood and Hydratex waterproof membrane. One of the biggest improvements that Firstgear has address with the TPG Expedition has been to upgrade the all the zippers with YKK! YKK have been an industry standard in high apparel for quality and durability. Along with the addition of YKK, Firstgear has also changed the length and angle of the main zipper to make it easier to get into and out of. They have also abandoned the miles of velcro and changed to a double rain gutter with snaps. The other really big upgrade is the the Firstgear TPG Expedition Suit now comes with a full compliment of D3O EVO armor including the back protector! The molecular construction offers greater flexibility and protection when compared to many standard protection options provided in most brands. 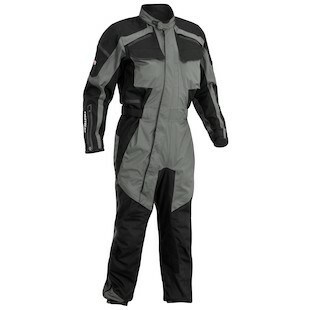 Couple that with the YKK zipper upgrades, direct venting and sizing that suits taller riders, Firstgear has brought some very well received updates to make your decision that much harder when deciding on a one piece touring/commuting suit.